Martin (mar-TEEN) M. Prado...owns a cattle ranch in the Orlando area. Marlins' 2018 Roberto Clemente Award nominee...Limited to 54 games due to injury...Began season on disabled list recovering from right knee surgery...Debuted on April 27, but was placed on DL a second time from May 26-July 5 (left hamstring strain) and a third time from August 13-31 (left quad strain)...Went 1x4 with a double and three RBI on September 1, but it marked final appearance of season due to right abdominal strain...On August 12 vs. the Mets, stole first base since September 14, 2016 at Atlanta. Appeared in just 37 games due to three stints on disabled list...Started season on 10-day disabled list with right hamstring strain suffered playing for Venezuela in World Baseball Classic. ..At the time he was forced to withdraw from WBC, was batting .368 with three doubles, five RBI, and a .526 slugging percentage. Against Italy, he became first player in WBC history to record a five-hit game, and delivered a game-winning RBI double in the 10th inning...Recalled from rehab and reinstated from 10-day disabled list on April 17; appeared in 17 games, batting .290 (20x69) with two doubles, two home runs, and six RBI before being placed on the disabled list on May 8 due to a strained right hamstring...Recalled from rehab and reinstated from 10-day disabled list on June 23, and appeared in 20 games before being placed on 10-day disabled list on July 18 for remainder of season with a strained right hamstring. Led National League (third in MLB) in average with runners in scoring position (.368); was sixth-highest mark in Club history...Ranked fourth in MLB (third in NL) with .340 average on road; was sixth-highest mark in Club history...Led Majors in average vs. left-handed pitchers (.424); was highest mark in Club history, besting .399 by Hanley Ramirez in 2007...His .305 average overall ranked 11th in NL, 19th in MLB...Finished second on Club with 49 multi-hit games, behind Christian Yelich (50)...His 18 games with three-plus hits ranked fourth in NL, behind Jean Segura (24), Charlie Blackmon (20), and DJ LeMahieu (20)...Had three consecutive three-hit games from April 27-29, tied for second-longest streak in Club history (19th time), one shy of record held by Cody Ross in 2008. - STATS LLC. Ranked third among National League third basemen with a .289 (134x463) batting average (.288/144x500 overall)...Led MLB third basemen in fielding percentage (.976); his seven errors were tied with Yunel Escobar for fewest among qualifying MLB third basemen...Hit .338 (47x139) in third spot in lineup, good for third in MLB...Hit .353 (42x119) over his last 32 games, with six doubles, a triple, four home runs, and 25 RBI...Had three walk-off RBI, tied for second in Club history for a single season... Recorded seventh career walk-off hit on September 4 vs. the Mets and his eighth career walk-off RBI on September 6, again vs. the Mets...Was first MLB player with two walk-off RBI in a three-game series since Jose Lobaton for Rays on August 16 & 18, 2013 vs. Toronto...Was just second Marlins' player to accomplish the feat in a three-game set, joining Dave Berg (Aug. 9 & 10, 1999 vs. San Francisco), according to Elias and Stats LLC...Also, Prado saw 12 pitches before hitting walk-off sac fly in the win on Sept. 6, including six straight foul balls prior to the RBI. According to Stats LLC, it was the most pitches seen in a plate appearance that resulted in a walk-off RBI since Jose Lopez had a walk-off single on the 14th pitch on May 1, 2009 for Seattle vs. Oakland...Set new career-high with five hits on September 4 vs. the Mets...Returned from rehab and reinstated from 15-day DL on July 17 (sprained right shoulder); appeared in three rehab games with Single-A Jupiter, going 3x10 (.300)...Reached base safely in 18 straight games from April 19 to May 9; posted .333 (25x75) average with 11 runs scored, five doubles, a home run, and 12 RBI over that span...Had season-long 11-game hitting streak from May 29 to June 9, his 13th career hitting streak of 10+ games...Posted .326 (15x46) average over streak, with three doubles, a triple, and three RBI...Recorded 450th career RBI with solo home run on June 12 vs. Colorado...On May 23 vs. Baltimore, recorded sixth career walk-off hit and RBI, first since August 22, 2014 for the Yankees vs. the White Sox. Hit .282 (172-for-609) with 36 doubles, 14 home runs and a career-high 82 RBI in 155 games in his fi rst season with Arizona...172 hits were the second-most by a fi rst-year D-back… only Luis Gonzalez's 206 in 1999 had more... Appeared in 113 games at third base, 32 at second, 30 in left field and 1 at shortstop…was 1 of 10 NL players with at least 30 games played in the outfi eld and infi eld... Struck out once every 12.53 at-bats, a career best and ranked third in the NL behind Norichika Aoki (16.85) and Marco Scutaro (16.09)... Tied for second with 20 second-half doubles, tied for third with 48 RBI and ranked eighth with a .324 average... Named NL Player of the Month for August, hitting .374 with 4 home runs and 30 RBI…established club August records in RBI and hits (43)…the 43 hits were the second-most in a month by a D-back behind Gonzalez (44 in May 1999)... Matched a club record with a hit in 7 consecutive at-bats from May 25-27 (fi fth time)... Tied a club record (fi fth time) with 4 straight multi-RBI games from Aug. 23-27, including 3 consecutive 3-RBI games from Aug. 24-27... Hit .455 (4-for-11) with 2 RBI in 3 World Baseball Classicgames with Venezuela. Established career highs in stolen bases (17), doubles(42), walks (58), RBI (70), games (156), hits (186) and at-bats (617) in his seventh and final season with Atlanta...Appeared in 119 games in left field, 25 at third base, 10 at second base and 4 at first...Ranked among National League leaders in multi-hitgames (1st, 60), hits (4th) and doubles (5th)...Became the 10th player in Braves' history (13th time)to tally at least 60 multi-hit games and first since TerryPendleton in 1992 (63)...Hit .323 (70-for-217) with 27 extra-base hits (22 doubles)vs. left-handed pitchers...led the Majors with 22 doublesvs. southpaws and tied for fourth with 27 extra-base hits...Started at four different positions in four straight gamesfrom Aug. 23-26 (left field, shortstop, third base and second) to become the first Brave to do so since Jerry Royster in 1984...Batted .321 (59-for-184) with 21 extra-base hits, 25 RBIand 19 multi-hit efforts in his final 47 games...POSTSEASON: Went 1-for-5 in the Wild Card Round vs.St. Louis. Hit safely in 53 of his 64 home games. Had a 19-game home hitting streak from 4/29-5/30 and hit .353(30-for-85) with five home runs and 19 RBI during that stretch...Had three separate 10-game hitting streaks (4/26-5/6, 5/8-18, 9/12-23)...Named National League Player of the Week for the week ending 5/15 (.462, 12-for-26)...Returned 7/15 from the 15-day DL after missing 31 games with a staph infection in his right calf...Stole two bases on 7/17 vs. WSH for his first career two-steal game...Collected his 10th game-winning RBI with a two-out walk-off single 9/4 vs. LAD...Hit his fifth career lead-off home run on 5/14. He teamed with Nate McLouth to record the Braves first back-to-back home runs of the season. The duo became the first to hit back-to-back home runs to start a gamefor the Braves since Rafael Furcal and Mark DeRosa did so on 5/28/03. Established career highs in hits (184), games (140), runs (100), home runs (15) and RBI (66). ... Suffered a season-ending injury on 9/27 vs. FLA. Examination that evening revealed a hip pointer and anMRI the next day showed a torn external oblique muscle. ... Finished ninth in National League Most Valuable Player voting. ... Ranked fourth in the NL in hits and was seventh in batting average. (.307). ... Ranked fourth in the Majors in multi-hit games (58) and was third in home batting average (.353). ... Logged his career-high 40th double on 9/22 at PHI (38 doubles in 2009). ... Returned to starting lineup on 8/17 after missing 16 games from 7/31-8/16 with a fracture in the "PIP" jointof his right pinky finger suffered in 7/30's game at CIN. ... Named to his first career All-Star Game and started at second base in place of the injured Chase Utley. ... Became the second-fastest player in Braves franchise history to reach 100 hits in a season (69 teamgames). Ralph Garr did it in 62 team games in 1974. ... Earned NL Player of the Week honors for the week ending 5/16 (.367, 11-for-30). ... Snapped his career-best 14-game hitting streak (.458) 4/18 (streak dated to 10/1/09). ... Hit .369 (24-for-65) in 15 interleague games while collecting six doubles, a triple, two homers and nine runsscored. Established career highs in hits (138), games (128), runs (64), home runs (11) and RBI (49)...Was named NL Player of the Week for 6/29-7/5, when he hit .577 (15-for-26) with a homer and six RBI...His 11 doubles in September tied for 2nd in the Majors..Equaled his career high with a 10-game hitting streak 9/16-27 (19-for-39, .487)...Hit safely in 71 of 97 games with an AB since 6/2, going 120-for-377 (.318) with 29 2B, 9 HR and 42 RBI...Also had 32 multi-hit games during the span...Prior to the All-Star break, hit .330 (62-for-188). Hit seven of his 11 home runs after the All-Star break...Capped a 4-for-5, four-RBI performance with a game-winnig single in the 10th inning on 6/30 vs. PHI. He is the first player in nearly a year to deliver a walk-off hit in a four-hit, four-RBI game...Batted in eight different spots in the starting lineup (all but leadoff)...Had his third four-hit game of the season and career on 10/2 vs. WSH...Played 63 games at second base, 41 games at third base and 23 games at first base. Set career highs in almost every category, playing a career-best 78 games while appearing at six differentpositions, including his first career games at first base, outfield (LF) and shortstop....Set and matched his career high with three hits, six times (last 9/24 vs. PHI)....Over his last 33 games, dating from 8/19, he was 42-for-128 (.328) with 11 extra-base hits (9 2B, 1 3B,1 HR), 15 RBI and 14 multi-hit games....Ranked fifth in the NL (min. 170 AB), hitting .335 (57-for-170) after the All-Star break with 15 2Bs and 25RBI....Led all MLB qualifiers (min. 50 PA) with a .432 (32-for-74) batting average in August. Also had nine 2B, oneHR and 12 RBI during the month....Batted in seven different spots in the starting lineup (all but 4th and 9th)....Started 49 games at five different positions (2B-15, 3B-15, 1B-14, LF-3, SS-2)....Hit RHP at a .349 clip (45-for-129) and hit .283 vs. LHP (28-for-99)....Hit .338 (22-for-65) with 27 RBI with RISP and .571 (4-for-7) with 10 RBI with the bases loaded. Martin came up to Atlanta four different times from Richmond and was a valuable bat and glove off thebench...Was recalled from Richmond (AAA) on 9/4 for the fourth time in '07. The other stints were 5/20-6/2,8/7-22 and 8/23-24...Played 2B and 3B with the Braves, making 11 starts (7 at 2B, 4 at 3B)...In his limited time with Atlanta, he hit .211 (8-for-38) off LHP and .429 (9-for-21) off RHP...Went 8-for-16 with all three doubles on the season during nine August games...Had 11 assists at 2B on 9/10 at NYM, the most for a Brave in a nine-inning game since 4/14/85 vs. SDwhen G. Hubbard had 12...Matched his career-high with two hits (done three times) on 8/12 at PHI and 8/20 at CIN...Batted .316 (125-for-395) with 61 runs, 4 HR and 41 RBI in 103 games at Richmond with a .374 OB pctTied for Richmond club lead with 23 doubles...Named as the International League 2B on the post-season all-star team...Finished 2nd in the International League with a .316 batting average. His average was second amongBraves' farmhands (Cole Miles, .317)...Hit safely in 46 of his last 57 games at Richmond (74-for-228, .325)...Named IL Batter of the Week (ending 6/30), hitting .382 (13-for-34) w/ 7 RBI...At Richmond, he hit .340 off LHP and .308 off RHP. He was a .338 hitter at home and .291 on the road...In July with the R-Braves, he hit .370 (37-for-100) with 3 HR and 16 RBI...Had two four-hit games, 5/9 at CHA and 7/20 vs. TOL...Played in 23 spring training games for the Braves and batted .354 (17-for-48) with six doubles, seven RBIsand a .407 on-base pct. Opened season at Mississippi (AA) before an April promotion to Atlanta...Made his major league debut on 4/23 at WSH and went 1-for-2 with a triple, two walks and a run...Hit .462 (6-for-13) with runners in scoring position...Started at 3B on 9/14 vs. PHI and hit first career HR with a three-run shot off Jamie Moyer in the fifth inning...Batted leadoff and had his second two-hit game in Game 1 on 9/3 at PHI...Was recalled from Richmond (AAA) on 8/21 and went 2-for-4 with 2 RBI vs. PIT...Batted .282/2/23 in 60 games for Richmond and .278/1/15 in 43 games at Mississippi. Hit a combined .298 (131-for-440) with 20 doubles, five HRs and 45 RBI between Myrtle Beach (A) and Mississippi (AA)...Hit .392 (31-for-79) in June...Had a season-high four hits on 6/5 at POT...Was promoted to Mississippi on 7/15 and hit safely in 25 of his first 26 games...Hit his first Double-A home run on 7/19 vs. Montgomery...Had a 13-game hitting streak 7/17-30 and a 12-game hitting streak 8/2-13. Ranked fourth in the South Atlantic League with a SO/PA ratio of 1/9/94...Ranked eighth in the SALwith a .315 BA...Ranked fifth in the Braves' organization and led Rome (A) with a .315 batting average, wasseventh and ninth in the organization with 135 hits and 68 runs scored, respectively...Named the postseasonAll-Star second baseman of the SAL and was selected to play in the regular season SAL All-Star game. Ranked fourth on the Gulf Coast Braves with 63 hits and 23 runs batted in...Led the team with sixtriples...Was second on the GCL Braves with nine stolen bases. Led the Dominican Summer League Braves 2 (Rookie) team in avg. (.319), runs (36), hits (75),doubles (19), runs batted in (36) and was second in stolen bases (14). Was second on the DSL Braves 2 (Rookie) in average (.299), was third in runs batted in (21). October 31, 2018 Miami Marlins activated 3B Martin Prado from the 60-day injured list. September 4, 2018 Miami Marlins placed 3B Martin Prado on the 60-day disabled list. Right abdominal strain. September 1, 2018 Miami Marlins activated 3B Martin Prado from the 10-day disabled list. August 14, 2018 Miami Marlins placed 3B Martin Prado on the 10-day disabled list. Strained left quad. July 5, 2018 Miami Marlins activated 3B Martin Prado from the 10-day disabled list. June 26, 2018 sent 3B Martin Prado on a rehab assignment to Jupiter Hammerheads. May 26, 2018 Miami Marlins placed 3B Martin Prado on the 10-day disabled list. Left hamstring strain. April 27, 2018 Miami Marlins activated 3B Martin Prado from the 10-day disabled list. 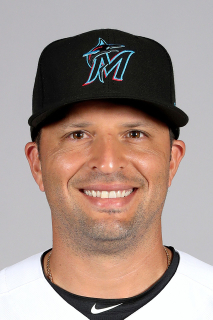 April 19, 2018 Miami Marlins sent 3B Martin Prado on a rehab assignment to Jupiter Hammerheads. March 29, 2018 Miami Marlins placed 3B Martin Prado on the 10-day disabled list retroactive to March 26, 2018. Left hamstring strain. October 2, 2017 Miami Marlins activated 3B Martin Prado from the 10-day disabled list. July 18, 2017 Miami Marlins placed 3B Martin Prado on the 10-day disabled list. Right knee sprain. June 23, 2017 Miami Marlins activated 3B Martin Prado from the 10-day disabled list. June 19, 2017 Miami Marlins sent 3B Martin Prado on a rehab assignment to Jupiter Hammerheads. June 16, 2017 Miami Marlins sent 3B Martin Prado on a rehab assignment to Jacksonville Jumbo Shrimp. June 15, 2017 Miami Marlins sent 3B Martin Prado on a rehab assignment to Jupiter Hammerheads. May 8, 2017 Miami Marlins placed 3B Martin Prado on the 10-day disabled list. Right hamstring strain. April 17, 2017 Miami Marlins activated 3B Martin Prado from the 10-day disabled list. April 12, 2017 Miami Marlins sent 3B Martin Prado on a rehab assignment to Jupiter Hammerheads. April 2, 2017 Miami Marlins placed 3B Martin Prado on the 10-day disabled list retroactive to March 30, 2017. Strained left hamstring. April 26, 2016 Miami Marlins activated 3B Martin Prado from the paternity list. April 23, 2016 Miami Marlins placed 3B Martin Prado on the paternity list. July 17, 2015 Miami Marlins activated 3B Martin Prado from the 15-day disabled list. July 7, 2015 Miami Marlins sent 3B Martin Prado on a rehab assignment to Jupiter Hammerheads. October 31, 2014 New York Yankees activated 3B Martin Prado from the 60-day disabled list. August 1, 2014 New York Yankees activated 3B Martin Prado. July 31, 2014 Arizona Diamondbacks traded 3B Martin Prado to New York Yankees for C Peter O'Brien and Player To Be Named Later. July 15, 2011 Martin Prado roster status changed by Atlanta Braves. July 13, 2011 Gwinnett Braves sent 2B Martin Prado on a rehab assignment to Mississippi Braves. July 6, 2011 Martin Prado assigned to Gwinnett Braves. June 10, 2011 Atlanta Braves placed LF Martin Prado on the 15-day disabled list retroactive to June 8, 2011. Staph infection in his right calf. October 13, 2010 Atlanta Braves activated LF Martin Prado. October 4, 2010 Tigres de Aragua signed 2B Martin Prado. August 17, 2010 Atlanta Braves reassigned 2B Martin Prado to the minor leagues. August 16, 2010 sent 2B Martin Prado on a rehab assignment to Gwinnett Braves. August 2, 2010 Atlanta Braves placed 2B Martin Prado on the 15-day disabled list retroactive to July 31, 2010. Fractured right pinky finger. October 8, 2009 2B Martin Prado assigned to Tigres de Aragua. August 21, 2006 Atlanta Braves activated 2B Martin Prado. April 25, 2006 Atlanta Braves reassigned 2B Martin Prado to the minor leagues. April 21, 2006 Atlanta Braves activated 2B Martin Prado. March 15, 2006 Atlanta Braves reassigned 2B Martin Prado to the minor leagues.